For the past five years or so the constant companion on my desk whilst I stare down my microscope has been a thick tome (2.8 kg) entitled Diatomeen im Süßwasser-Benthos von Mitteleuropa by Gabi Hofmann and colleagues. It serves as my aide-mémoire when I am analysing freshwater diatoms, jogging my memory when I see a diatom that I recognise but whose name I have forgotten. Before this was published, I used a French publication Guide Méthodologique pour la mise en oeuvre de l’Indice Biologique Diatomées which was free to download (I cannot find a link on the web any longer, unfortunately). Neither of these is the last word in diatom taxonomy, but that was not the point: a lot of the time, I just need a gentle reminder of the right name for the species I am looking at, and I don’t want to have to pore through a pile of books in order to find this. One of the strong points of both books is that they are copiously illustrated, and the plates are arranged very logically so that similar-shaped diatoms are together, making it easy to pick out differences. For most routine identification, this is exactly what is needed: we may pretend that we are logical people but, in truth, pattern matching beats using a key nine times out of ten. The 133 plates in Diatomeen im Süßwasser … act as a visual index and, to make life even easier, the species descriptions are arranged alphabetically and cross-referenced in the plates. Having found an image that resembles the diatom I am trying to identify, it is straightforward to flick to the description to check the details. There is just one problem: Diatomeen im Süßwasser-Benthos von Mitteleuropa is in German, and quite technical German at that. I tell people not to worry because all the images are in English but, in truth, I worry that I may lose some of the nuances due to my linguistic limitations. I was delighted, then, to be asked by Marco Cantonati to help produce an English version of the book. Marco is half-German so reads and speaks the language fluently, and I was able to work on his first drafts in English to produce the final text. Conscious that translating a German book into English is only a partial solution for the almost 70% of the EU who have neither as their first language, we also unpicked the prose in order to put the information about each species into a series of “bullet points” so that it was more accessible and we also took the opportunity to update some of the taxonomy. A large part of last weekend was spent poring over the proofs so it should not be long now before it is available to purchase. Hofmann, G., Werum, M. & Lange-Bertalot, H. (2011). Diatomeen im Süßwasser-Benthos von Mitteleuropa. A.R.G. Gantner Verlag K.G., Rugell. Prygiel, J. & Coste, M. (2000). Guide Méthodologique pour la mise en oeuvre de l’Indice Biologique Diatomées. NF T 90-354. Cemagref, Bordeaux. Amidst the dreary nothingness of the sample that prompted the previous post, I stumbled across the diatom in the photograph above. This image gives a misleading impression as it is a relative large diatom with considerable variation in three dimensions and my first thought was that I was looking at a fragment of vaguely diatom-like structures amidst a unfocussed blur. Careful use of the fine focus control revealed the twisted nature of the structure and I was able to create this semi-focussed image from a “stack” of images of the individual focal planes using Helicon Focus software. The scale bar is 10 micrometres (= 1/100th of a millimetre). As there are relatively few diatoms with a frustule with such a contorted form, it was relatively easy to identify it as Surirella spiralis Kützing 1844. 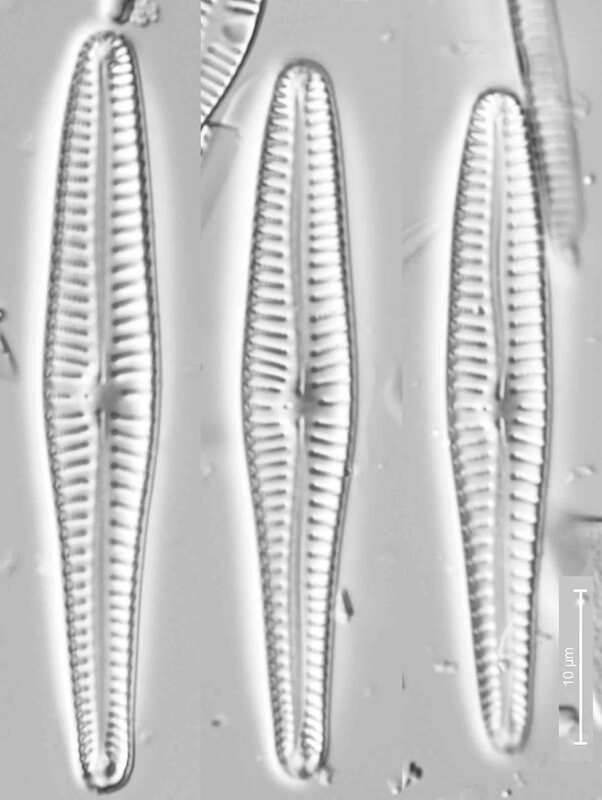 Surirella spiralis is one of a small number of diatoms whose outline is twisted. There are diatoms that show considerable curvature within a single plane (see Stenopterobia sigmatella in “Reflections from Ennerdale’s Far Side”) but few where this curvature occurs between planes. 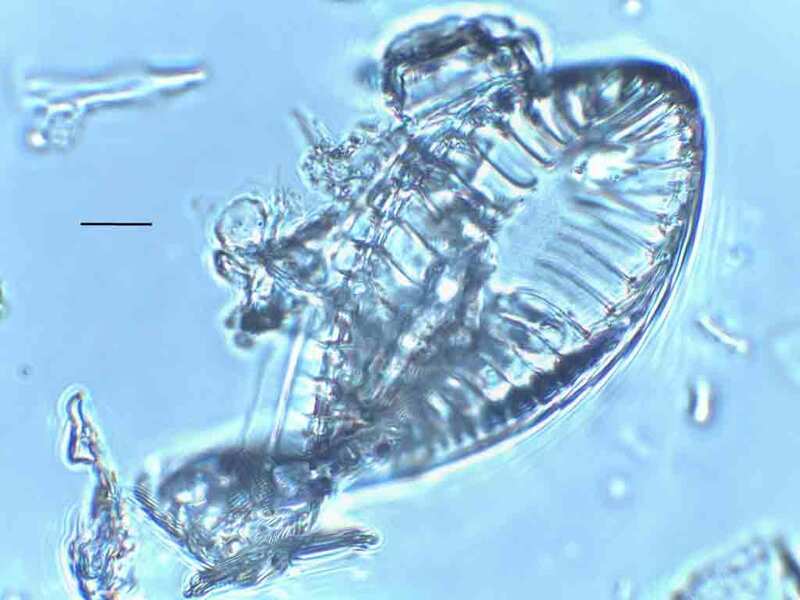 The only other diatom with this feature that I have written about in this blog are Entomoneis (see “A typical Geordie alga …”) and Cylindrotheca (see “Back to Druridge Bay”). These twisted diatoms, like sigmoid diatoms such as Stenopterobia, typically have motile habits. In my post on Stenopterobia I wondered what advantage a sigmoid outline conferred on a diatom and we really need to ask the same questions when thinking about twisted diatoms. I have the germ of an idea, but want to think it over some more before unleashing it onto the world. Surirella, Stenopterobia and Entomoneis are all members of an order of diatoms, the Surirellales, that are the subject of a recent paper by Elizabeth Ruck, from the University of Arkansas, and colleagues. They compared morphology and genetic differences amongst members of this order, along with a related order, the Rhopalodiales, two of whose members are Epithemia and Rhopalodia, both of which I have also written about in this blog. Their conclusion is that current generic limits need an extensive shake up with long-established genera that seemed to be based on sensible criteria when viewed with the light microscope split apart and reassembled, based on ultrastructural and genetic characteristcs. The order Rhopalodiales has been subsumed into Suriellales. It will be interesting to see whether or not, and how quickly, these names diffuse through the community of scientists who study diatoms. Taxonomy has a dual nature: on the one hand, specialists are driven by a desire to understand how evolutionary forces have shaped and differentiated a group of organisms; on the other hand, taxonomists act as biology’s janitors, sorting and organising information about species so that other biologists can use this for their own purposes. 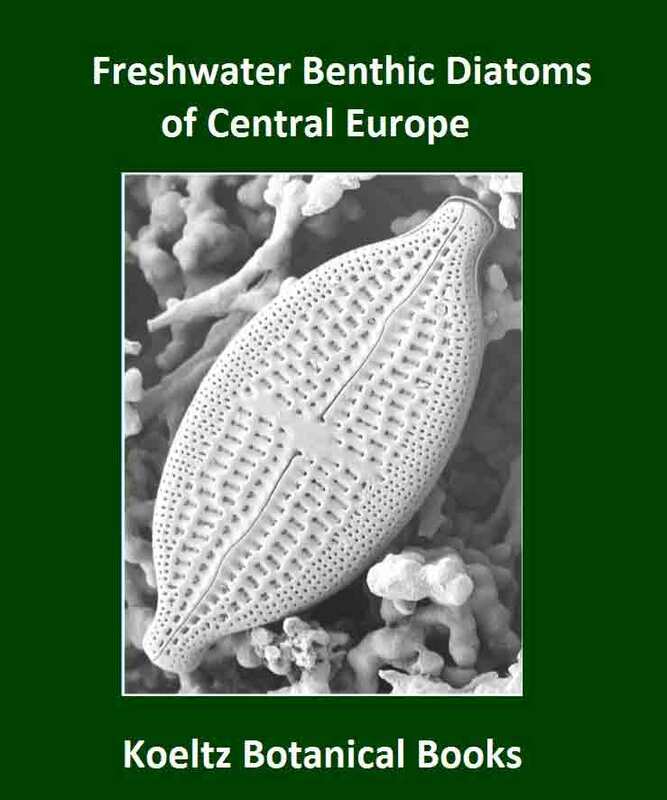 I am the editor and co-translator of a guide to European diatoms that was being finalised just as this paper was published and which, as a result, uses the “old” names. These books often have a ten or twenty year shelf life which will prolong the use of these names, and slow the uptake of new ones. I also know, from many years training people to analyse diatoms, that taxonomic changes, however well justified, sow confusion among beginners. On the other hand, we are entering a new era, when molecular barcoding will be used more widely for routine identification of diatoms and, for this, a correct understanding of the phylogenetic relationships amongst a group of organisms improves the accuracy of the bioinformatics routines that assign names to the diatoms. For most practical purposes, in other words, Surirella spiralis will remain S. spiralis for some time (and Stenopterobia sigmataella will remain S. sigmatella too), if only because of the innate conservatism of most of the people who work with diatoms. My use of the old name in this post means that the part of my readership who know at least a little about diatoms could place the diatom within a familiar framework, even if Iconella spiralis is the correct name. The term “post-truth” has entered our political vocabulary over recent months; in diatom taxonomy and identification, however, we sometimes have to accommodate “pre-truth” as well. Ruck, E.C., Nakov, T.., Alverson, A. & Theriot, E.C. (2016). Phylogeny, ecology, morphological evolution, and reclassification of the diatom orders Surirellales and Rhopalodiales. Molecular Phylogenetics and Evolution 103: 155-171. Ruck, E.C., Nakov, T.., Alverson, A. & Theriot, E.C. (2016). Nomenclatural transfers associated with the phylogenetic reclassification of the Surirellales and Rhopalodiales. Notulae algarum 10: 1-4. A curious moment of serendipity saw me stuffing a new scientific paper into my bag to read on the train as I travelled to a workshop on reduction linocut printing. A second instance of serendipity occurred when I walked close to the site of Thomas Bewick’s studio in Newcastle as I contemplated the contents of this paper whilst walking from Newcastle Station to Northern Print‘s workshop in the Ouseburn Valley. I was, clearly, destined to write a post on natural history illustration, and the problems of reproducing images. 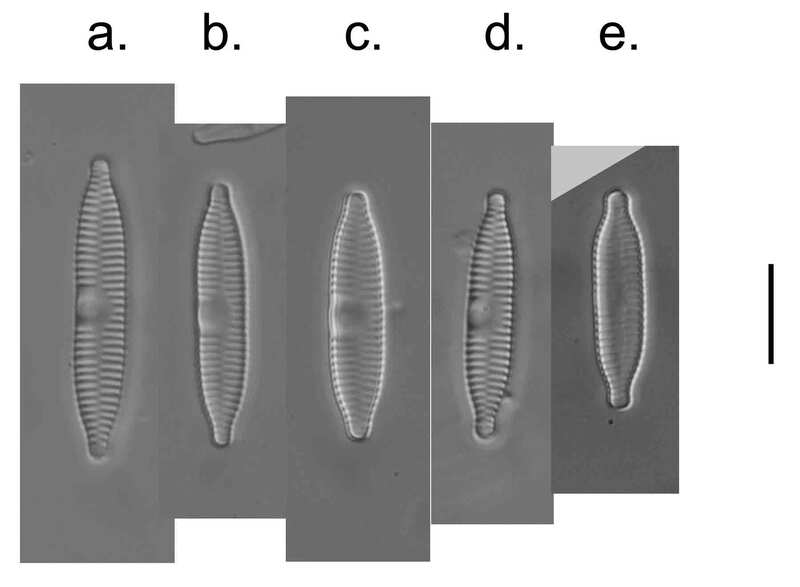 The paper I was reading related the efforts of Carlos Wetzel and colleagues to understand the taxonomy and nomenclature of a group of very small diatoms, historically placed in the genus Navicula but more recently spread between Sellaphora and Eolimna. The problem they address is essentially one of calibration: do the names we use for modern diatoms correspond to the organism to which the name was first applied, or has our understanding of that species gradually ‘drifted’ over time so that we now use it either for a different species altogether, or for a number of species that match the original description? The plate below puts the problem into perspective. It shows a number of specimens corresponding to the description of what we thought was Eolimna minima at the time, though should now probably be called Sellaphora nigri. These cells are mostly less than a hundredth of a millimetre in length, have a linear-elliptical outline and few surface features that can be resolved easily with the light microscope. Small variations in the valve outline and the density of striae had encouraged diatomists to establish new species and varieties until there were a large number of names in circulation and it was not always easy to separate the wheat from the chaff. Wetzel and his colleagues had tracked down the original descriptions and the “type material” (the specimens that formed the basis of these original descriptions) in an effort to sort out the mess. Sellaphora nigri / Eolimna minima from Menahyl River, St Mawgan Bridge, Cornwall, September 2009. The scale bar is approximately 10 micrometres (= 1/100th of a millimetre) long. Specimens are arranged into two “morphotypes”: “narrow” and “blunt”. Photographs: David Mann. Our understanding of diatoms is driven in large part by the technology available to scientists at any point in history. 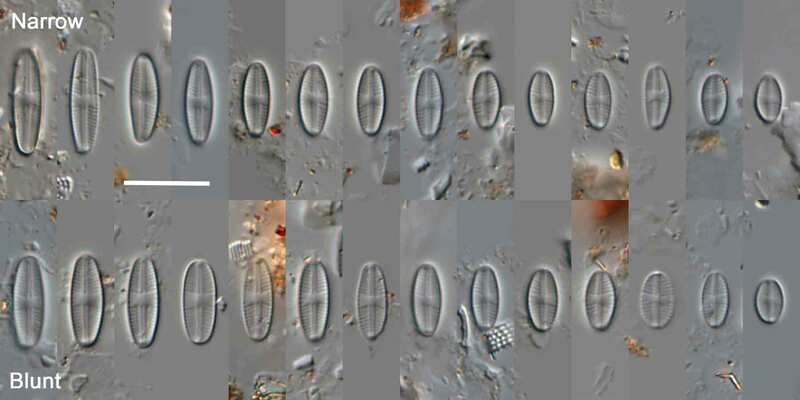 Not surprisingly, the first diatoms to be described tended to be the larger species, relatively speaking, and it is no surprise that the earliest descriptions of the very small forms that are the subject of this post are rather basic. These date back to Kützing in 1849, Rabenhorst in the 1850s and Grunow in the 1860s, all of whom would have had relatively basic microscopes by modern standards, and who worked without electric light with which to illuminate their specimens. They also did not have access to high resolution mountants, which only became available in the middle of the twentieth century. Nor were they able to photograph their specimens and, indeed, any drawings that they made would have had to be passed to a specialist engraver, who would have transferred the image either to a woodblock (using the ends of hard woods such as box and cherry rather than cutting into the grain) or a metal plate. So there would have been at least two steps between the observer’s initial view of the diatom and the published illustration which, in the case of diatoms such as these, was working right at the edge of the resolution of the light microscopes of the day. It is no surprise, then, that the organism that Kützing described as “Synedra minutissima” and which later workers considered to be a small Navicula has subsequently bounced through several genera (and families), before Wetzel and colleagues decided on the basis of light and electron microscopical observations of Kützing’s original material that it probably belonged to Halamphora. Image reproduction is, I suspect, almost as significant as optical technology in determining the rate of advances in understanding of diatoms. 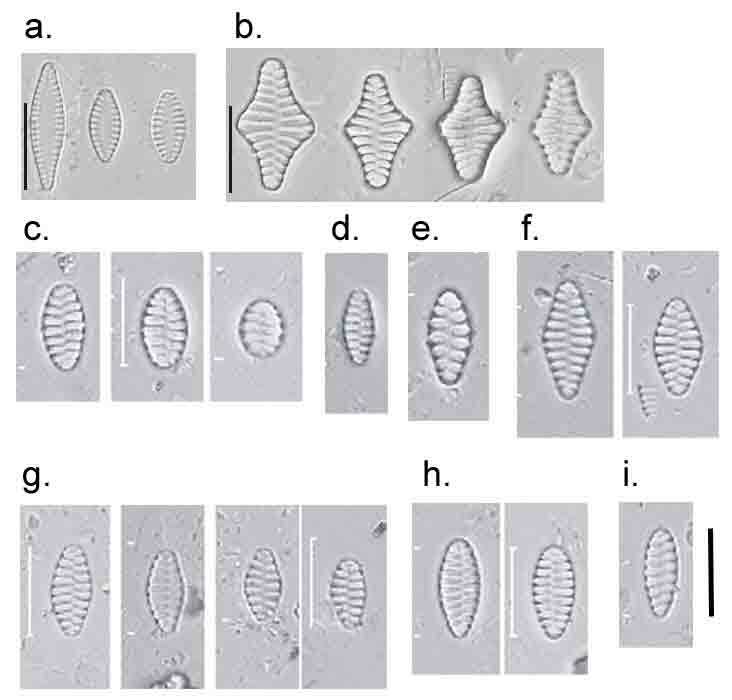 You only have to look back at papers in Diatom Research published only 20 years ago, and compare both the quality and quantity of images to understand this. Photo-editing packages such as Photoshop and CoralDraw are the unsung heroes of modern diatom taxonomy, enabling images to be edited and rearranged in multiple combinations. We can now do in a couple of hours what would have taken weeks of time for an engraver in the 19th century, capturing images of a quality that would have been beyond Kützing’s wildest dreams. Having done this, we can then discuss the results via email and Skype with people in other countries, or even different continents. Yet there is one final twist to this tale: the plate of Sellaphora nigri / Eolimna minima is one of a series of plates that David Mann put together last year whilst he and I were pondering some RbcL sequences from field populations. The genetic information seemed to be telling us that there were several distinct genotypes within complexes that we were identifying, with the light microscope, as Eolimna minima. The scale of difference was such as to suggest that these genotypes may well be distinct species, albeit barely discernible even with the very best light microscopes available. We put that work aside, distracted by other, more pressing tasks, but I dug out the plates when thinking around the issues I’ve discussed in this post. So it is quite possible that we have still not solved all the mysteries of this group of tiny, but very common, diatoms. Wetzel, C.E., Ector, L., van de Vijver, B., Compère, P. & Mann, D.G. (2015). Morphology, typification and critical analysis of some ecologically important small naviculoid species (Bacillariophyta). Fottea, Olomouc 15: 203-234. Uglow, J. (2006). Nature’s Engraver: A Life of Thomas Bewick. Faber and Faber, London. When is a diatom like a London bus? This post takes us back to Semer Water (see “Lake Lakelake Lake”) for a closer look at some of the diatoms that live in the littoral zone. I studied this lake back in 2012 as part of a project funded by Natural England, and recently used one of the samples collected as part of that study for a “ring-test” amongst diatomists involved in routine ecological assessment in the UK and Ireland. This provides an opportunity for a number of experienced analysts to take a detailed look at the diatoms present in a sample and compare notes. Between us, we found over 90 different species that we could name in a single sample, amongst which there were a number that caused us no disagreement and a few where we struggled to achieve a consensus. And there was one group where we achieved a consensus of sorts insofar as the entities that we found matched the pictures in the latest reference works, but shared a sense of misgiving about whether the names we used told the whole story. The diatoms that caused these problems were representatives of a group of small diatoms that, for a long time, were grouped in the genus Fragilaria but which, following a paper by David Williams and Frank Round in 1987, were split between several different genera including Pseudostaurosira, Staurosira and Staurosirella. This generated some controversy although, as the dust settled, most people agreed that these taxa definitely did not belong in Fragilaria, even if the exact allocation of species between the genera continued to excite debate. The plate below shows three “species” that we found in Semer Water although the suspicion is that the seven forms I’ve called “Staurosirella pinnata” may represent several different species. Small Fragilaroid diatoms from the littoral zone of Semer Water August 2012. 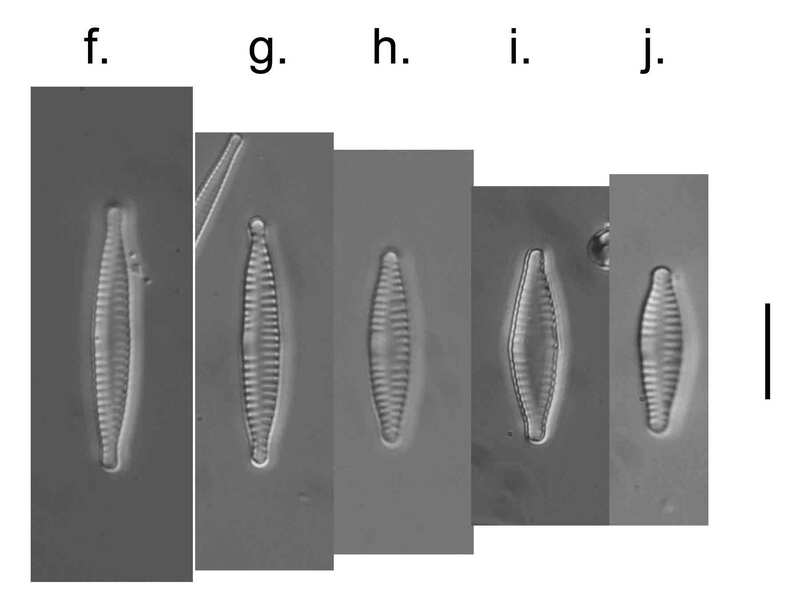 A. Pseudostaurosira brevistriata; b. Staurosirella leptostauron; c. – i. different morphotypes within the “Staurosirella pinnata” complex. Scale bar: 10 micrometres (= 1/100th of a millimetre). In order to test this association, I searched my database and found 705 records where at least one of the more common species in the complex were found (out of a total of 3838 records). 309 (44%) of these contained more than one species, but this figure leapt to 82% when I only considered samples where the sum of these species exceeded two per cent, and a mighty 98% when I just included the 90 samples where the sum exceeded ten per cent. You can see this trend clearly in the graph below where I have plotted the percentage of one species against the sum of the percentages of the other four that I have considered. The issue gets more complicated when we consider that some of the so-called species could, themselves, be complexes of several species that can co-exist (as in the case of Staurosirella pinnata in the plate above). 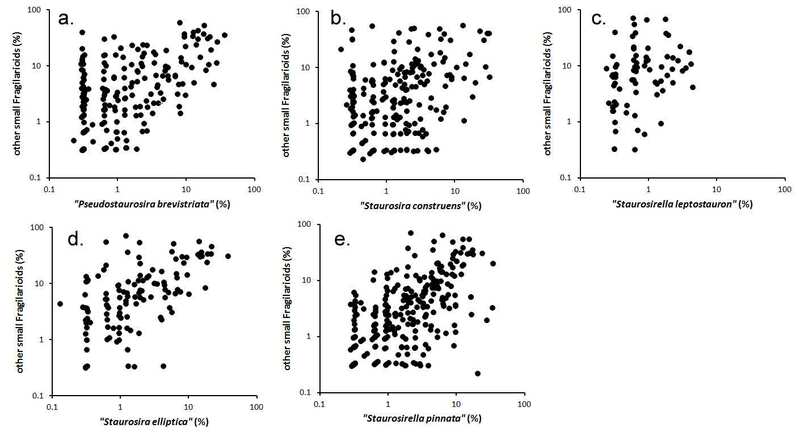 Co-variation in relative abundance of common Fragilarioid species. Each plot shows the percentage of one species (or species complex) on the x axis, and the combined percentage of the other four species on the y axis. Log scales are used for the sake of clarity. 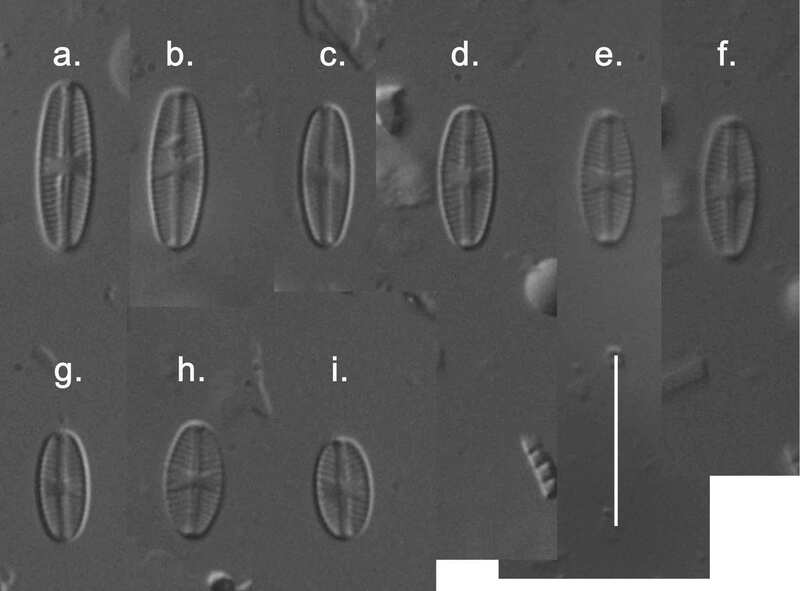 a. Pseudostaurosira brevistriata; b. Staurosira construens (and varieties); c. Staurosirella leptostauron; d. Staurosira elliptica ( = Pseudostaurosira trainorii); e. Staurosirella pinnata complex. What is going on here? If they all live in the same habitat then, in theory, the “competitive exclusion” principle should work to eliminate all but the fittest. That two or more appear to co-exist on a regular basis suggests that they are occupying distinct niches that we are not recognising with our usual methods of studying the microscopic world of lakes and rivers (see “Baffled by the benthos (1)” and “Baffled by the benthos (2)”). It might be a physical niche, but the niche could also be defined by chemical or biological factors. Could it be, for example, that these different but (fairly) closely-related forms differ in their levels of resistance or tolerance to fungal or viral infections? Or do they have subtle variations in the amount of light that each needs, but which are obliterated by our unsubtle sampling methods? The result is the diatom equivalent of a “perfect storm”: neither the taxonomy nor the ecology are described with any great clarity. It is possible that a better understanding of the taxonomy will lead to a more nuanced appreciation of their ecology. Taxonomists often dangle this bait, but the sad truth is that there are few cases where ecologists emerge blinking into the light after the taxonomists have finished their fiddling. But ecologists must take their share of the blame, being very conservative in the methods that they use to deduce ecological differences between species. I could, in fact, use my 1930 edition of the Süsswasserflora vön Mitteleuropa to identify this group of species and, apart from the name changes, reach exactly the same conclusions as I might have done 85 years ago. Thanks to Ingrid Jüttner (National Museum of Wales) for the diatom photographs, and Eduardo Morales (Bolivian Catholic University, Cochabamba, Bolivia) for taxonomic assistance. Williams, D.M. & Round, F.E. (1987). Revision of the genus Fragilaria. Diatom Research 2: 267-288. Morales, E.A. & Trainor, F.R. (2008). A new paradigm for freshwater fragilarioid diatom classification? A critique of Lange-Bertalot’s new system. Journal of Phycology 37 (supplement): 36-37. I encountered yet another instance of a species that had dropped out of the collective consciousness of biologists last week, with some help from colleagues Lydia King and Luc Ector. I co-ordinate an exercise whereby all those of us who analyse diatoms regularly for ecological assessments in the UK and Ireland calibrate themselves against one another. The last sample that we used for this exercise came from a small stream in County Tyrone, Northern Ireland, and it contained a mess of Fragilaria species that proved to be rather challenging. Some we could name quite easily, others took a little more work. Amongst these Fragilaria species was a nice population of Fragilaria vaucheriae, with its distinct one-sided central area, linear-lanceolate outlines and coarse striae. This was close in all respects to the type description, and presented us with few challenges. Fragilaria vaucheriae from Trillick Tributary, Carran Bridge, County Tyrone, Northern Ireland, May 2014. Scale bar: 10 micrometres (1/100th of a millimetre). Photographs: Lydia King. However, there was also a number of valves in the sample which were similar in many respects to the description of F. vaucheriae in the standard floras, but was slightly narrower and which had a more lanceolate outline. 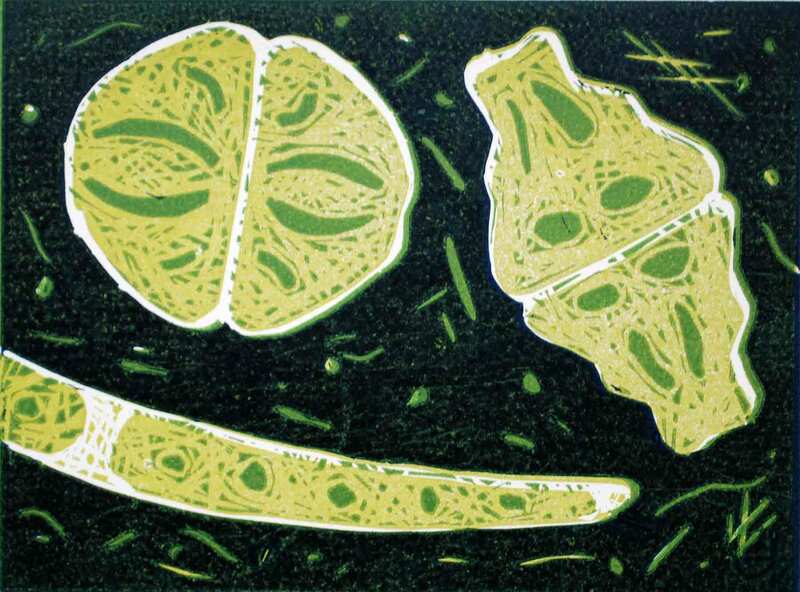 Confusingly, a very similar diatom is illustrated in the 1991 edition of the Sübwasserflora von Mitteleuropa as one of a number of illustrations of “Fragilaria capucina var. vaucheriae”. Our sample, however, had two distinct populations: the broader valves which correspond to “true” F. vaucheriae and the narrower ones that many of us, using the Sübwasserflora, have “lumped” into F. vaucheriae simply because there were no more plausible alternatives on offer. Luc Ector eventually pointed us towards descriptions and illustrations of another species, Fragilaria pectinalis, which does look very similar to Lydia’s photographs. Our only slight concern is that the stria density in our population is slightly lower than in the description of the type population of F. pectinalis. For this reason, we are referring to our population as “Fragilaria cf. pectinalis”, until we are more certain. Fragilaria cf. pectinalis from Trillick Tributary, Carran Bridge, County Tyrone, Northern Ireland, May 2014. Scale bar: 10 micrometres (1/100th of a millimetre). Photographs: Lydia King. Fragilaria pectinalis is an interesting case study in the rise and fall of species names. This species is the type species for the genus Fragilaria, meaning that it was the first species in the genus to be formally described (by Lyngbye in 1819). It was known from even earlier, albeit under a different name, Conferva pectinalis, although the earliest illustrations are very schematic and hard to interpret. What is interesting is how it disappeared from Floras and identification guides throughout the 20th century. It is not in Hustedt’s first edition of the Sübwasserflora von Mitteleuropa, nor is it in West and Fritsch’s Treatise on British Freshwater Algae (1927), Patrick and Reimer’s Diatoms of the United States (1966) or the second edition of the Sübwasserflora, as I have already mentioned. I suspect that it has generally been lumped into Fragilaria vaucheriae for most of this time. It is only thanks to the detective work of Akihiro Tuji and David Williams that has managed to bring the name back into circulation. The next step, I guess, is to get it into the standard identification literature again. My experience is that busy ecologists often do not have the time to trawl through the vast and rather dispersed primary literature every time they encounter a form that they do not recognise. Hence they exhibit a tendency to squeeze forms into the closest category in the books that they do have. Luc Ector has started the wheels rolling by including it into his recent publication but perhaps we’ll also see it in the next edition of Diatomeen im Süßwasser-Benthos? Bey, M.-Y. & Ector, L. (2013). Atlas des diatomées des cours d’eau de la région Rhône-Alpes. Direction régionale de l’Environnement, de l’Aménagement et du Logement Rhône-Alpes. http://www.rhone-alpes.developpement-durable.gouv.fr. Tuji, A. & Williams, D.M. (2006b). Typification of Conferva pectinalis O. F. Müll. (Bacillariophyceae) and the identity of the type of an alleged synonym, Fragilaria capucina Desm. Taxon 55: 193-199. Tuji, A. & Williams, D.M. (2008). Examination of types in the Fragilaria pectinalis – capitellata species complex. Pp. 125-139. In: Proceedings of the Nineteenth International Diatom Symposium 2006 (edited by Y. Likhoshway). Biopress, Bristol.